Here is a guide on how to fix start menu and cortana nor working error in Windows 10. Microsoft launched its latest Windows 10 operating system last year and is a giant improvement in terms of performance and features when compared with Microsoft’s previous offering Windows 8/8.1 desktop PC OS. However one of the common issues that many Windows 10 users are facing is the start menu and cortana not working error on their PCs. This problem is being encountered by many when they start or restart Windows 10 PC. If you have been getting this critical Windows 10 error then keep on reading to learn ways to fix start menu and Cortana error on Windows 10 PC desktop / laptop. Windows 10 Start menu and Cortana are not working critical error usually occurs at the startup and users get the Start menu and cortana aren’t working. We’ll try to fix it the next time you sign in error message. You may try to restart PC to see if that resolves the issue for you but there is no guarantee that simple restart works on every PC. You need a permanent fix to address this issue and to get rid of this critical error for good. Some users have reported that restarting PC fixed the problem, but many others are saying that it gets worse when you try to restart as the start menu and cortana error message in Windows 10 reappears. This error has forced many to revert back to the older Windows 7, Windows 8/8.1 operating systems from Windows 10. Thankfully, there is solution to this problem which will fix start menu and cortana on Windows 10 PC and after which you won’t be forced to downgrade to Windows 7/8/8.1 OS. Although, Microsoft has released an official fix for the Windows 10 start menu and cortana error, but the error can resurface for some reason, therefore, it is important that you know how to manually fix the start menu and cortana in Windows 10 without needing to wait for the official fix every single time. There are a number of ways you can fix Windows 10 start menu not working and Cortana not working error on PC. If the problem does go away after a restart, then follow the solution methods below to fix Windows 10 error. The most successful method that you can use to fix Start menu and cortana aren’t working critical error in Windows 10 includes removing those apps that have been causing this error in safe mode. For that, you must first reboot Windows 10 into safe mode. 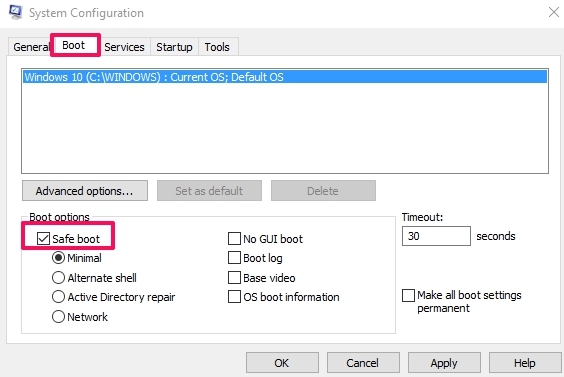 But since the start menu isn’t working, here’s how you can reboot Windows 10 into safe mode. In the Task Manager window, click on the File and then click Run New Task to open the Run command box. Type msconfig in the Run command box and hit enter to open System Configuration window. In System Configuration window, under Boot Option, click on Safe boot and hit OK to restart PC. When your PC reboots in safe mode, you need to uninstall apps after downloading which the start menu and cortana stopped working properly. Now open System Configuration box again and disable the Safe boot option. All done. After the restart start menu and cortana not working error should be fixed permanently. Also note that installing incompatible software, apps or antivirus tools can interfere with the normal functioning of the start menu and cortana. Above solution works almost all the time. However, if for some reason it doesn’t, don’t fret over it too much because there are some other ways, though less reliable than the above method, you can use to fix start menu and cortana on Windows 10 PC. Here some more solutions that you can try to fix start menu and cortana error if the above method didn’t work. Press Windows + R keys to open RUN command box. Locate Application Identity and right-click on it and select Start. This should fix the error. If not, see the next solution. Click File in the top-left corner of the task manager window, and click Run new task option from drop-down menu. Type PowerShell in Run new tasks command box and hit enter to open Windows PowerShell. Right-click on the PowerShell icon on the taskber and select Run as Administrator option. If you don’t see PowerShell on the tasks bar, navigate to task manager > fewer view mode top open PowerShell as Administrator. Now you will a list of running apps, Right-click on PowerShell and select Open file location to see the location on PC where the PowerShell is saved, click on its icon to open it as administrator. Wait for it to execute, ignore any error on the command prompt screen. Or you can open Windows command prompt, type Powershell and hit enter to go to the powershell prompt as admin and then enter the above command. This solution should fix the problem but if it remains, then see the next fix. Right-click on the Start icon (Windows logo) and select Command Prompt (Admin) from the list. or go to Start > Windows System > Command Prompt as run it as admin. That’s all. Windows start menu and cortana error should be fixed by now otherwise see the next solution. Restart Windows Explorer to fix start menu or cortana error. Open the Task Manager or simply right-click on the taskbar and select Task Manager. In the Process list of Windows task manager, find Windows Explorer option and right-click on it and then click Restart. This should solve your problem otherwise move on to the next solution. This method is preferred by many to fix start menu and cortana error. All it requires is to delete the TileDataLayer folder. Press Windows + R to open RUN command box. Type %LOCALAPPDATA%\ and hit enter. That’s all. This should work to fix the start menu and cortana critical error on Windows 10 PC. If none of the solution mentioned above worked to fix start menu or cortana error in Windows 10, try Windows system restore. If system restore isn’t working see the solution for fixing Windows system restore. System restore takes Windows 10 back to the previously saved fully working copy of Windows OS on your PC in case new update installed some corrupt system files on Windows 10 PC. Or you can fix corrupt system files in Windows 10 to see if that brings start menu and cortana back to working state. Let us know if you are having trouble in implementing steps in above solutions or send feedback regarding start menu or cortana error in the comments section.